Fire Emblem Heroes was released for Android and iOS devices on Feb. 2. This was the first time that the 26-year-old franchise was released for a mobile device. Fire Emblem is well-known for its strategy role-playing style of gameplay, so it was interesting to see how the series would be adapted for mobile devices. Thankfully, it’s be adapted well for one-handed gameplay. As a long-time fan of the series, I was both excited and hesitant to play the game. Fire Emblem Heroes uses the gatcha mechanic that is common in Japan, which means you use summoning orbs, the game’s currency, to get new characters to build your team. To get summoning orbs, you can either buy them using real money or you can complete in-game tasks to receive them. With each summon session, you can spend up to 20 summoning orbs and get five randomly selected heroes from previous Fire Emblem games. This mechanic can produce a mix-bag of characters. Some characters can be great and some can be not-so-great. I found myself becoming a bit frustrated when trying to get specific characters that I wanted, but getting multiples of characters I didn’t want at all. It’s a straightforward game to play. Each map consists of an eight by six grid, which is perfect for mobile devices. At first, it can be confusing on how to move the character, but once you get used to dragging the character across the map, it becomes easier to play. As with every other Fire Emblem game, Heroes utilizes the weapon triangle, a take on rock-paper-scissors, to determine which units are stronger than another. In this game, red beats green, green beats blue, and blue beats red. 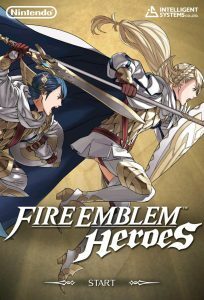 The game’s story is a bit sparse and did provide players with four original characters, the two protagonists, Alfonse and Sharena, and the two antagonists, Veronica, and a mysterious masked man. There are times where I wish more was explained in the story, but with more chapters, in the form of paralogues or side-chapters, being added on a regular basis, there’s hope more will be explained. There are some negatives when it comes to Heroes, however. The game does drain the phone’s battery and there doesn’t appear to be an option for a battery saver mode. The Arena battle mode has caused me a few problems when facing against other players who have two or more of an overpowered character that can make it difficult to beat them. This makes it hard to earn points in the arena and it can discourage a player. I have found myself playing this game every day and enjoying myself. Trying to get a certain character can be difficult and frustrating, but that’s what one should expect when playing this type of game. Even with some of these frustrations, I would recommend it to anyone that enjoys strategy games.